Ello is getting its 15 minutes of social media fame: More than a million people are still clamoring to join the ad-free social network. It doesn't even have a mobile app, and yet Ello has inexplicably caught the social Web by storm within weeks of launching on an invitation-only basis. The company's timing and decision to add new users by invitation-only were incredibly shrewd, but it also got a lot of outside help along the way and from the unlikeliest of sources. As is often the case in situations like this, Facebook unintentionally sent droves of users to Ello when it implemented a policy requiring all of its users to use their "real" names. Ello, which describes itself as a "simple, beautiful and ad-free social network," has also gathered steam from those interested in a less intrusive social framework for the Web. In a matter of weeks, Ello became a place for those wanting to maintain their identities of choice and those who don't want their social activity to be bought and sold for the almighty advertising dollar. "Your social network is owned by advertisers. Every post you share, every friend you make and every link you follow is tracked, recorded and converted into data. Advertisers buy your data so they can show you more ads. You are the product that's bought and sold. We believe a social network can be a tool for empowerment. Not a tool to deceive, coerce and manipulate -- but a place to connect, create and celebrate life. You are not a product." It's hard not to applaud and root for something as grandiose and altruistic as Ello's vision, but a social network is only valuable to those who perceive it worth their time and energy. If something gets posted on Ello, who is there to see it? The site is still in beta, and since Ello is allowing users to join only by invitation (existing users get five invite codes to share) it remains closed or at least restricted by design and technical capability. Like other sites that began via invite only, Ello is riding a wave of interest because being or becoming a user of Ello still comes with at some perception of exclusivity. These things are important to some people and Ello knows it, even if the company says its "servers will melt down" if too many people join at once. 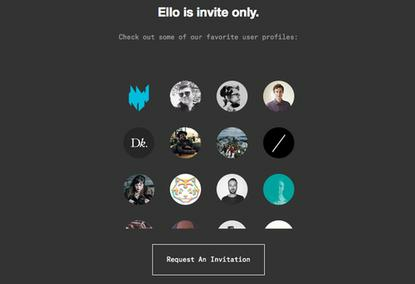 As the noise surrounding Ello intensified, I eventually made my request for an invite at Ello.co on Sept. 26. But impatience got the best of me later that day when Ello's founder Paul Bunditz claimed that the company was receiving 45,000 requests to join per hour and had "more than a million requests in the queue." Fortunately thanks to some tips shared on Twitter and elsewhere I was able to guess an invite code and make my way into Ello without anxiously waiting for my number to be called. The shiny lustre and excitement of joining a new site wore off almost immediately after I set up my profile. There just isn't much to it right now. The site is clean, overwhelmingly simple and filled with beautiful, wide open white space where ads most typically appear on other social networks. It's refreshing at first, but that sense of wonder quickly gives way to a general bewilderment about the limits of Ello that seemingly appear with every click. In fact, you'll probably run out of things to click on pretty quickly. Ello follows the norm with a "discover" tab where some of its users are promoted similar to how other social networks will highlight their more prolific and popular users. Unfortunately, the only other way to find users is to manually search for someone or scroll through another user's following and followers lists. You can follow and categorize as either "friends" or "noise" depending on where and in which feed you'd like their posts to appear. Twitter-like @mentions enable users to have conversations with other users on Ello, but there's no organization or grouping of those conversations leaving the context and flow completely broken. For some, the nagging and well-founded privacy concerns encircling Facebook continue to foment disdain and a longing for social networks that reflect their values and beliefs regarding data collection, privacy and advertising. Facebook's "real-names" policy created a backlash that grew into a protest movement over the past couple weeks, making Ello an obvious landing pad for some of those seeking the latest "anti-Facebook" wannabe. Facebook eventually relented on the controversial policy last week when its chief product officer Chris Cox issued an apology to the "affected community of drag queens, drag kings, transgender, and extensive community of our friends, neighbors and members of the LGBT community for the hardship that we've put you through in dealing with your Facebook accounts over the past few weeks." Cox writes that Facebook's policy has never been to require everyone to use their legal name, but rather the "authentic name they use in real life. For Sister Roma, that's Sister Roma. For Lil Miss Hot Mess, that's Lil Miss Hot Mess." The trouble began when one Facebook user reported several hundred of these users' accounts as fake, and since 99 percent of the several hundred thousand fake name reports Facebook receives every week are "bad actors doing bad things" these accounts were asked to verify their names by submitting some form of ID, according to Cox. Cox goes on to defend the 10-year-old policy as "part of what made Facebook special in the first place by differentiating the service from the rest of the Internet where pseudonymity, anonymity, or often random names were the social norm." The policy remains unchanged, but Facebook's enforcement of fake account reports will be managed in a "less abrupt and more thoughtful way," Cox writes, adding that "this policy, on balance, and when applied carefully, is a very powerful force for good." Facebook's reversal of course on this issue probably won't impact Ello's outlook much at this point, having already benefited from the subsequent buzz and widespread interest in spades. Ello's more important and widely revered commitment to never sell advertising will always be the source of its greatest challenges. There's plenty of startups with VC funding for an ads-based business model, but very few get cash from investors for a company that outright despises advertising. So one must imagine that most of Ello's anti-advertising users were content with the service right up until a fellow user discovered that the company had already accepted $435,000 in funding from the Vermont based venture capital firm FreshTracks Capital. "VCs don't give money out of goodwill, and taking VC funding -- even seed funding -- creates outside pressures that shape the inevitable direction of a company" Ello user Andy Baio writes in his post. "I think the intentions of the team are pure, and they genuinely believe in what they're building. But I'm not sure intentions matter unless they can wean themselves off outside funding," he adds. Ello appears to have the support of its financiers for the time being, and is quick to point out that the founders still own more than 80 percent of the company. But unless Ello hits a home run with the premium, paid offering it envisions as its primary revenue stream, there won't be many options left for the company. Advertising, for better or worse, continues to be the path of least resistance to revenue for any online destination or social network. Without it, the challenges are more profound. And the successes, if they happen at all, are usually characterized by acquisition offers or other generous exits determined by factors almost entirely unassociated with the company's revenue. Ello can't be taken seriously at all until it at least releases a mobile app. A social network with no mobile app? We've had many of those before, albeit few with no ads, and the ones that are still around have all moved to mobile. Social and mobile are mutually beneficial, and that should have been part of Ello's story and design from day one.